Back in the spring of 1998, I remember being really pumped when I found out that they were remaking Godzilla. There hadn’t been a decent Godzilla film since the ill-conceived Godzilla 1985, which frankly was about as bad as the 1976 “Jeff Bridges” King Kong remake. I’ve always been a big fan of the campy Godzilla/kaiju films where costume monsters fight it out through scale models of cities and countrysides. 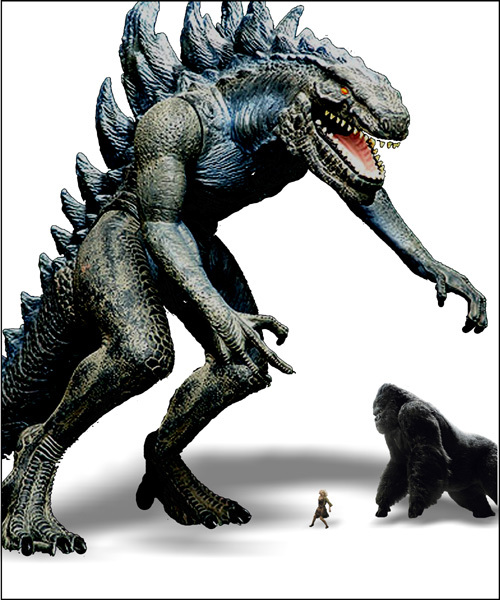 My favorite was King Kong Vs. Godzilla, where my two favorite city-destroying monsters went toe-to-toe for the title of world’s ultimate monster. In the US release, King Kong wins, but I was dutifully informed that overseas Godzilla got the final nod. The latter is a myth first printed in the 1960s Spacemen magazine and then repeated more than once in Forest J. Ackerman’s influential Famous Monsters of Filmland periodical. Godzilla loses. Period. I went to the very first showing of the 1998 Godzilla. The film poster proclaimed that Size Does Matter. It was a great excuse to eat popcorn. Fast forward a few years and we get Peter Jackson’s remake of King Kong. One of the first things that pops into my mind, other than the crucial question of whether it would include dinosaurs [the lack of which made the Jeff Bridges remake lame in my opinion], was whether it would open the door for a King Kong Vs. Godzilla remake. Yes, to dinosaurs. No such luck for a rematch. 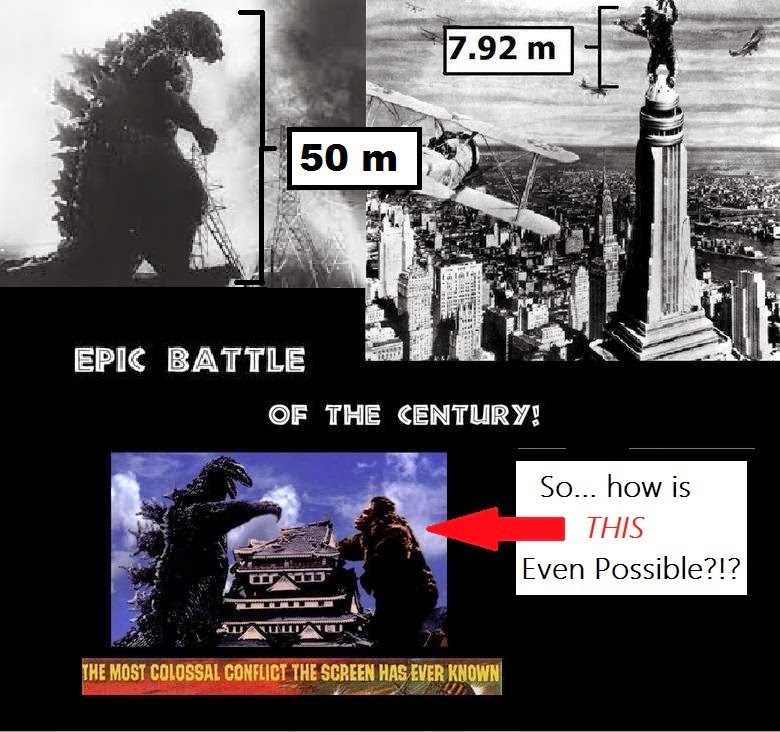 Because the new King Kong was actually very tiny compared to the new Godzilla. Rather than rating as a potential rival for King of All Monsters, the new King Kong rates simply as snack-sized. There is no contest I could imagine where the new Kong ends up swimming away in victory. The newest incarnation of Godzilla (2014) just makes matters much, much worse. 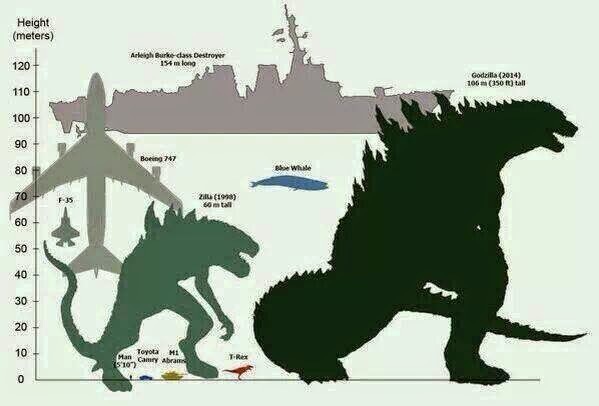 The newest Godzilla is fully TWICE the size of the 1998 version! Peter Jackson’s Kong rates more hardly noticed pest than respectable snack, er, I mean rival. 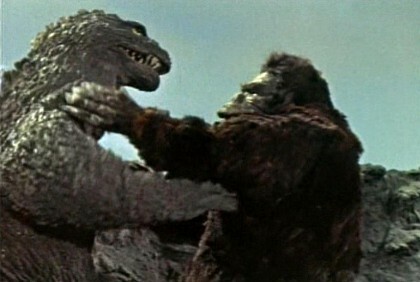 It had never occurred to me that Toho’s 1962 King Kong versus Godzilla had set up a false expectation in movie-goers. You see, Toho had ignored the dimensions of Merian C. Cooper’s 1933 King Kong. Cooper’s Kong was approximately 8 meters tall, compared to a Godzilla who has traditionally stood at about 50 meters at the time. Of course, if we look at Godzilla over time, filmmakers have continually made him bigger and bigger, with the exception of the 1998 Matthew Broderick version which returned him to his original dimensions. 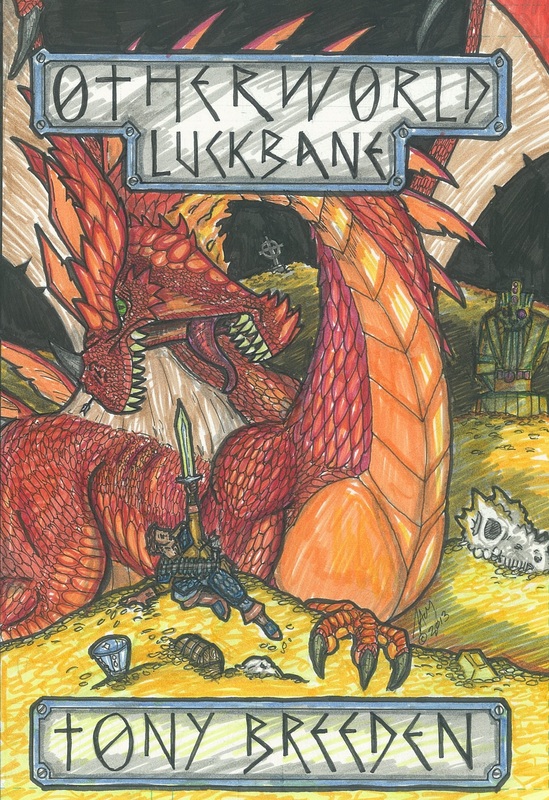 I was thinking about the issue of scale as I began doing the mock-up for the cover of Luckbane. 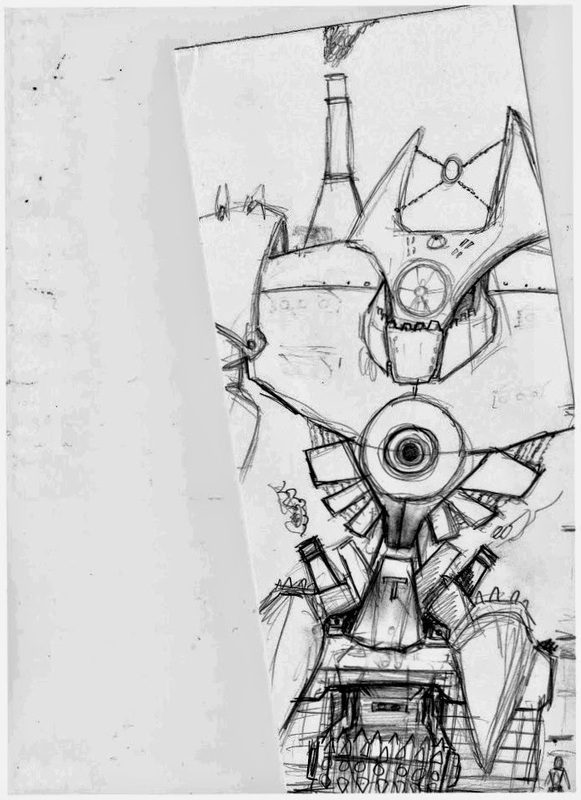 Luckbane is full of larger-than-life opponents, including a 5-story steampunk war machine named Hekla the Destroyer [see sketch below], a dragon called Gargath the Merciless and an undead bone dragon called Necrophoros. It was Gargath I decided to put on the cover. When I was writing Luckbane, I once described the dragon Gargath the Merciless’ eyes as “the size of a shield.” Just prior to doing the artwork, I began digging through my files, sifting through sketches I’d already made for Otherworld. It turns out that I’d had the foresight to make a size comparison chart for my humanoid races [humans, orcs, ophidians, etc]. Part of that chart is available here on this site. One of the odd things I did, which turned out to be quite useful, was to include a dragon’s head for scale. I kept that size comparison chart in mind when I was writing the early scenes, but it’s easy to get lost in description when you’re writing a book, even with a good set of guides. As I looked at that size comparison chart, the first thing that struck me was that my dragon’s eyes were not at all “shield-sized.” At best, they were the size of a man’s head or plate-sized… impressive nonetheless. This brings up an important point: consistency is important whether you’re writing or drawing – and especially if you’re drawing something you’ve written about. I can’t count the number of times I’ve been happily reading a book, only to find myself reading a description that flatly contradicted a previous chapter’s description. Just as bad are the times I’ve found myself stopping to compare a written description with the image on the cover of the book. Why don’t publishers require their cover illustrators to actually read the books they’re doing? Would that be asking too much? As I was writing this post, it occurred to me that there is one other area where we often forget to do a size comparison: God vs. the Devil. Let me make this as clear as I can. Satan is a created being, a fallen archangel with limited power and only half the angelic forces God has at His command. One of the limits of Satan’s power is that he cannot create so, while God could theoretically keep creating new angelic hosts, the Devil would be doomed to lose any long-standing engagement by attrition. Another limitation is that, again, God and Satan are not equals by any stretch of the imagination. When the Bible says there was a war in heaven, it is not referring to a fight between God and Satan, but rather a war between the heavenly hosts under Michael the archangel and that third of the heavenly that Satan managed to deceive into rebellion. Essentially, Michael did God’s light work. Lucifer could no more wage war against God than an ant could wage war against a descending size 12-zillion boot. God is omniscient; Satan lacked foreknowledge to realize his rebellion was doomed. He still doesn’t know everything, so God is able to use Satan’s most well-laid schemes to His heavenly advantage and for the good of them who love Him! Neither is Lucifer omnipresent; much of what we give the Devil credit for is simply natural evil, resulting from man’s sin or ultimately the Curse that resulted from Adam’s sin. He can’t “devil” you all of the time. The only reason he seems stronger is that mankind’s population has exponentially grown and the evil effects of Adam’s sin with it! The Devil’s power and influence have not grown; his job is simply made easier by the pervasive presence of fallen man. Make no mistake, that Heavenly size 12-zillion boot is still descending, despite all of the Devil’s schemes… and Lo! his doom is sure! What about you? What’s you favorite or least favorite King Kong or Godzilla movie? Are you a fan of kaiju movies? Have you ever run across an inconsistency in a book or movie that just wrecked the experience for you? Leave a comment below. If you want to find out more about my writing, visit my site at http://TonyBreedenBooks.com, my Author Facebook page at http://facebook.com/tonybreedenbooks or sign up to receive our newsletter at http://eepurl.com/AH88P. Nice post – I loved how you interwove the movie, your characters, and the amazing awesomeness of God! In my Christian fantasy trilogy, the main creatures that take a large part in the story are griffins (there are also sea serpents, nagi, howlers/werebeasts, and other such creatures). The griffins often carry one or two humans; and I've struggled with the size of their dimensions, say . . .when they visit a king in his castle or when they stay at a way-station or fort. It's hard to imagine the right size “indoor” space for them. BTW, I found your blog via a Christian writer page on facebook. It's nice to meet you. What you say now for the new kong?